There are two main paths to attain the Divine. One is a path of kripa or grace, and the other is a path of sadhan or spiritual practice. In the path of kripa, Shri Krishn’s mercy, through the guru, removes all the obstacles in our spiritual life and takes away all the bad habits within us, a process which is called anarth nivritti. 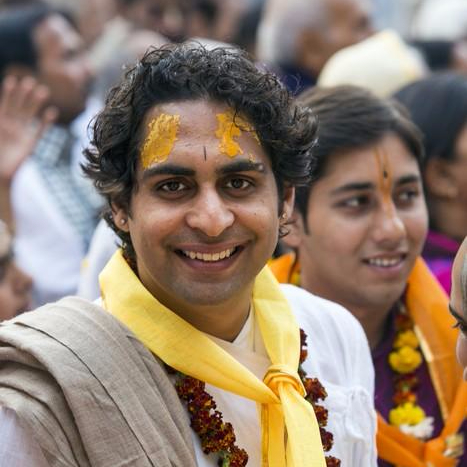 His mercy lifts us up into the stage of bhav bhakti, where the first ray of sacred love (prem) appears. On the other hand, the path of sadhan is where our own spiritual practice makes us move forward. Many spiritual schools emphasise either the path of kripa or the path of sadhan. But in Gaudiya Vaishnavism, our acharyas have taught that we need both kripa and sadhan to attain Eternal Vrindavan. We can understand this by a simple analogy. Imagine you are stuck at the bottom of a dark well, and you desperately want to escape. So you cry out, “Krishn, help me!” This is sadhan. Then Krishn comes and sends down his rope of mercy to rescue you. This is grace. The next step is very important. Now that Krishn has sent you the rope of his grace, you need to grab that rope and hold on tight. Then Krishn will pull you out. Sometimes kripa comes to us, but we are not in the right mindset to hold on to that mercy. Though Krishn may be showering his mercy on us, if we are not stable in our spiritual practice, that kripa won’t work on us. It’s like when someone gives us food, we still need to use our hands to eat and nourish ourselves. In the same way, if you want to attain Vrindavan, you need a mixture of both kripa and sadhan. Nowadays, I see devotees depending more on their own efforts or sadhan, without the right understanding of kripa’s magic touch. Once Krishn’s mother Yashoda tried to bind him with a rope after finding him stealing butter. However, because of Krishn's innate power to get whatever he desires automatically (satya sankalp shakti), the rope Yashoda used was always two fingers too short. Yashoda used all the string in her house to make the rope longer; she even used the ribbons from her hair. But no matter what, the rope was always too short. This is because Krishn’s kripa is the queen of all his shaktis, and it melts his heart like butter. When Queen Kripa comes, Krishn’s other shaktis, like the power to get whatever he wants (satya sankalp shakti), run away. The rope had been two fingers too short, and these two fingers represent the devotee’s effort or sadhan and Krishn's kripa. Without sadhan and kripa, says Vishwanath, the rope will always remain two fingers too short. While attempting to follow this instruction, we tend to forget that Krishn cannot be attained just by showing a little bit of humility. In fact, many of us only pretend to be humble, but our hearts are full of pride. There is so much competitiveness amongst devotees. I am a senior devotee, and you are my junior. I have read so many scriptures, but you are very new! Don’t try to teach me! I already know everything! I chant so many rounds on my mala every day, so I am better than you. I serve Shri Priyalal ju better than anyone else. I do the best srngaar! I donate so much money to charity, and others should acknowledge me for that. These are just a few examples of pride amongst devotees. When we walk the path of devotion thinking that our spiritual practices should make Krishn happy, we are only fooling ourselves. We feel satisfied that what we are doing is more than enough. But the right mood is that we should feel grief and beg for kripa through our practice, just like the man at the bottom of the dark well. Example 1: The Brahmins of Mathura took great pride in their fire offerings (yagyas). Krishn came to them, but they were so absorbed in their practices that they ignored him and missed the chance to get his mercy. Example 2: During the Raas Lila, when Shri Krishn appeared before the gopis, they felt pride. The moment pride appeared in them, Krishn disappeared. Then the gopis started their sadhan by searching for him throughout Vrindavan. Crores of gopis were there searching for him. They asked the trees, the Yamuna River, the wind and everyone else they saw, just trying to find out where Krishn had gone. Then they started singing the Gopi Geet (their song of separation). But Krishn still didn’t appear, because the gopis were still relying on their own efforts. Krishn of Vrindavan cannot be achieved by sadhan alone. We are not immune to pride even whilst doing our spiritual practices, which keeps Krishn far from us. We must reject this pride and cry for kripa if we want to attain Eternal Vrindavan. In reality, nothing we can do will ever be enough to make Krishn appear before us. As we can see in the Raas Panchadhyayi, all the efforts or sadhan of the gopis couldn’t make him appear. The only way for us to attain sacred love is by the kripa of the great devotees. It may seem like only Krishn should be able to give kripa, and not devotees. After all, devotees are jeevatmas – souls who can be influenced by maya. But this is not the case. Jeev Goswami states that Shri Krishn has stored some of his kripa within his devotees, so that they can distribute it throughout the world. To put in another way, the devotees are the medium through which Shri Krishn gives his kripa, like how the wives of the Mathura Brahmins became the link between Shri Krishn's grace and their own husbands. Gurudev has the treasure-trove of Mahaprabhu’s grace at his fingertips. We must ask him to shower that grace upon us, while humbly doing the sadhan he so mercifully bestowed upon us. Only by his grace can Shri Krishn appear in our life.